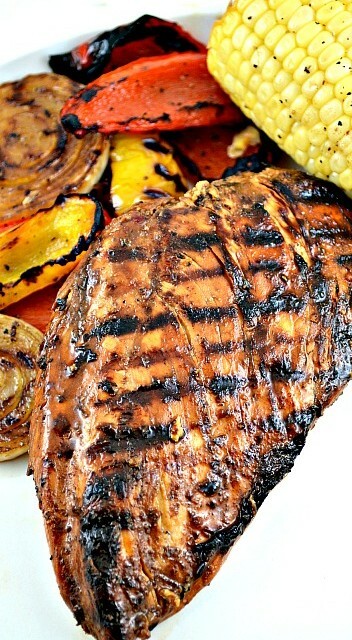 Our Fav Grilled Chicken Marinade Recipe, your goto “nothing fancy” down-home delicious grilled meal. Balsamic and onions = a flavor festival. This is, “That Recipe”. The one you use all the time. The simple. The easy. The YUMMY. I think most everyone has a recipe like this. It’s the one you pull out when you want a, “nothing fancy,” but absolutely delicious, type of down-home satisfying grilled meal. Marinading Time: This recipe is best when marinated overnight. Six to eight hours will do in a pinch, but it honestly is much, much better when marinated overnight. The balsamic vinegar gives the chicken a nice sweetness. Onions: The recipe has a couple of onions in the marinade. They, of course, add great flavor but also make a nice veggie side. Cut the onion fairly thick, so it’s easier to flip when you’re grilling. I generally grill plain peppers and corn that have not been marinated alongside to round out the meal. Our Fav Grilled Chicken Marinade Recipe, your goto "nothing fancy" down-home delicious grilled meal. Balsamic and onions = a flavor festival. Add the olive oil, soy sauce, balsamic vinegar, minced garlic and the Good Seasons Italian Dressing package to a 1 gallon Ziploc bag and carefully seal it then swish everything together well. Add chicken breasts and onion. Press out as much of the air from the bag as possible and reseal it. Place on a rimmed dish or plate in case bag leaks. Refrigerate until ready to grill. Flip bag halfway through marinating time. When you're ready to grill, prepare grill by heating and lightly oiling. Remove chicken and onion from marinade and shake off excess marinade. Discard marinade. Grill chicken on high for about 4-6 minutes, depending on the temperature of your grill. Flip and repeat until done. Grill onions with a foil pan over them, flipping as they brown, for about 15-20 minutes. Beer Brats– Fire up the grill for these amazing Beer Brats! Crispy, grilled sausages infused with mustard, beer, and caramelized onions. Perfect for Home or Tailgating! I like your video!!!!!!!! And the recipe is great, thank you very much! This is definitely my type of thing! Love all the flavors in it! Perfect for garden parties too! What a yummy marinade Kathleen! I’m definitely a gas grill kind of girl too! Love the looks of this chicken! This definitely sounds like an easy dish to whip up. And even better that it’s on the grill! Thanks Gayle! Don’t you just love grilling! That marinade sounds really good! I love having some quick, go-to recipes like this.